By, Dulue Mbachu and Ardo Hazzad. Business ExchangeBuzz up!DiggPrint Email .At least 600 people were killed in violence between Muslim and Christian ethnic groups in Nigeria, triggered by opposition protests against President Goodluck Jonathan’s victory in the April 16 election, a local civic group said. The mainly Muslim supporters of Muhammadu Buhari, a former military ruler in Africa’s top oil producer and candidate of the Congress for Progressive Change, attacked backers of Jonathan, the election winner, of the People’s Democratic Party, and clashed with Christians in the Kaduna city, the state capital. The violence spread to seven other towns and cities in the mainly Muslim region. Nigeria, Africa’s most populous nation with 150 million residents, is roughly split between a mostly Muslim north and a largely Christian south, a divide reflected in voting for the election. Buhari won all of the country’s 12 northern states while Jonathan took 23 of 24 in the mainly Christian central and southern states. Jonathan, a Christian from the oil-rich Niger River delta region, defeated Buhari by 57 percent to 31 percent, according to the Independent National Electoral Commission. Buhari’s party rejected the outcome, saying it was marred by fraud. Most local and international observers, while noting incidents of underage voting and suspicious turnout figures, called the vote credible. The last elections, in 2007, were described by international and local monitors as flawed because of intimidation of voters and ballot fraud. 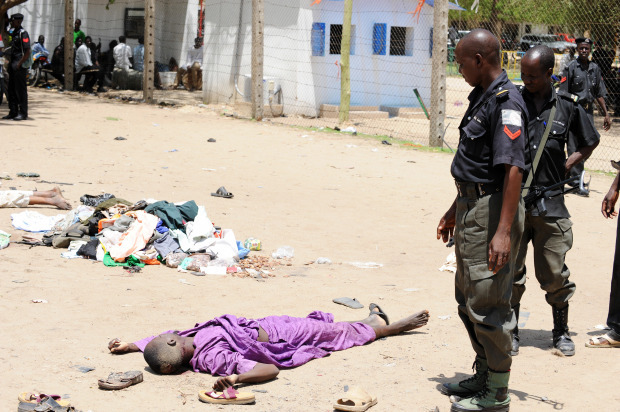 Ahead of state governorship and legislative elections tomorrow, troops have been deployed across the north to quell the violence and in some southern cities to forestall reprisal attacks against Muslims, the military said. A night-time curfew is in place in some cities. 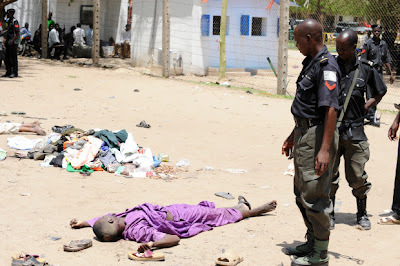 Three explosions occurred in the northern Nigerian city of Maiduguri late yesterday, injuring dozens of people, Mai Mamman, a police spokesman in the city said. The blasts were being investigated, he said. More than 14,000 people died in ethnic and religious clashes in Nigeria between 1999 and 2009, according to the Brussels-based International Crisis Group. To contact the reporters on this story: Dulue Mbachu in Abuja at dmbachu@bloomberg.net; Ardo Hazzad in Bauchi via Accra at ebowers1@bloomberg.net. To contact the editors responsible for this story: Antony Sguazzin at asguazzin@bloomberg.net; Andrew J. Barden at barden@bloomberg.net.